Do you have an 8 year old girl in your life? Are you stuck for gift ideas? 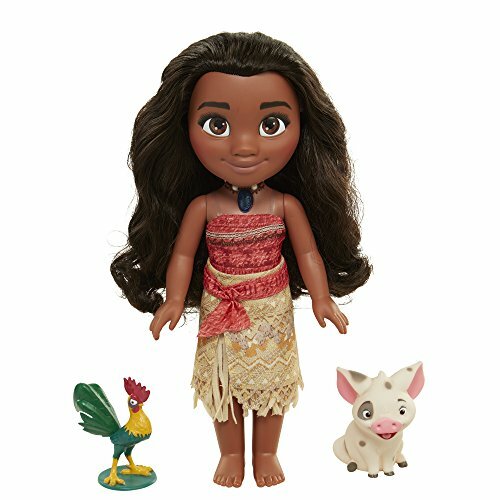 These are some of the Best Gift Ideas for 8 year old girls. I am a grandmother of a sweet 8 year old girl who loves gifts that are fun, educational, uplifting and time consuming. Your little princess wants to learn so many things and to explore and appreciate the world she lives in. Reading, crafts, science projects and imaginative toys all contribute to helping her become a well rounded adult. She loves to dance and sing and celebrate life. Learning to cook is on her interest list at this age too. Education is a life long process for everyone, and toys and playing can be great instructors. Every girl loves to have cool and unique items to decorate her bedroom or personal play space. Using gifts of room decor items to personalize and coordinate themes or colors will make an excellent gift for any special occasion. Combine rainbows, sparkle and the ability to create shapes in the sparkles and you will have any 8 year old girls attention. 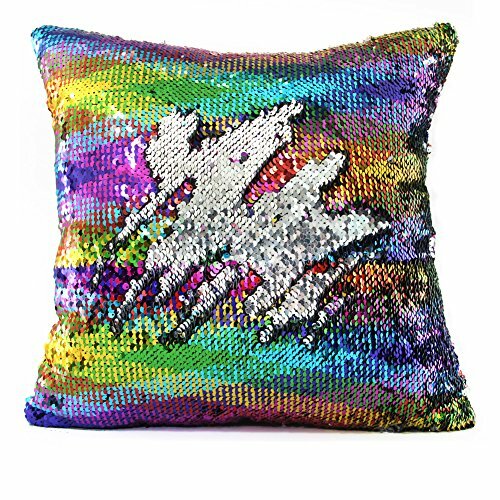 This 'groovy' sequined pillowcase will have her grinning ear to ear. The 2 sided sequins enable the user to brush or use fingers one direction and have the other color show. You can draw initials, flowers, shapes or let your imagination go wild. This featured product has rainbow colors one direction and silver sequins the other direction. There are other colors to choose from. Pick a color that will go with your tweens decor. The pillow cover measures 15.7 inches square and has a zippered bottom. The reverse side of the item is a soft polyester that can be slept on. There is NO pillow, just the slipcover. This uber cool item will have to be hand washed and laid flat to dry. What a 'dreamy' gift! This brightly illustrated book is geared for kids from ages kindergarten to grade 4. The words are at just the right level for an 8 year old. It encourages girls to use their imaginations. The author is C. S. Kelly, and the amazing illustrator is Jordy Farrell. The book was published in January of 2017. The hardcover book has 36 pages. Gracie is a girl with a vivid imagination. Her and her clever dog Monkeybear go outside to play one summers day. Follow 3 imaginary tales that last a single day. What an imagination she and her doggie have. 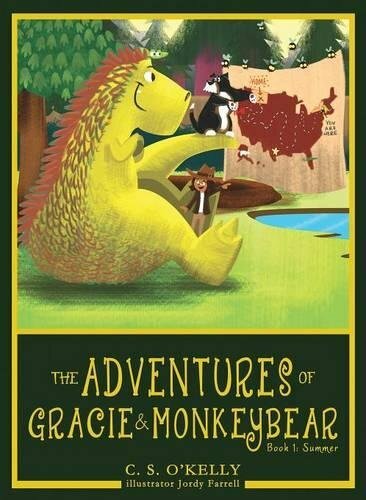 One imaginary adventure has the duo unearthing a live T-Rex and rescuing the stuck dinosaur. Next they see an alien spacecraft crashing. Fortunately, they speak this alien language and assist in space ship repairs. The last fantasy adventure involves a whale. It is a "whale of a tale". 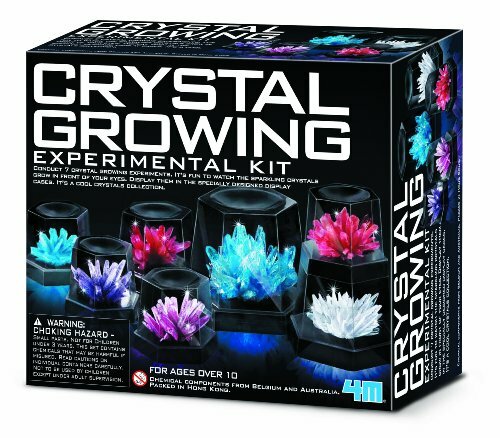 A crystal growing kit is the best gift idea for an 8 year old girl. There are experiments to grow 7 different crystal projects. All materials needed are included in the kit, including domes to store the completed crystals. Adult supervision for the 8 year old is advised while completing the project. Results are amazing IF directions are followed exactly. Tip: If you happen to have a silica package (like the kind found in a pill bottle), put it under the dome with the crystal and it should last for a long time. What better way for your inquisitive 8 year old girl to learn about the history and science of perfume making than by creating her own personal perfumes? This science project for girls informs her about the plants, extracts and oils that are blended to create perfumes and colognes. Your 8 year old girl will learn how the brain and nose work together. This science kit includes all the needed items to create her own scents. Perhaps this project will be a start a journey from the kitchen table to the science lab of the future. 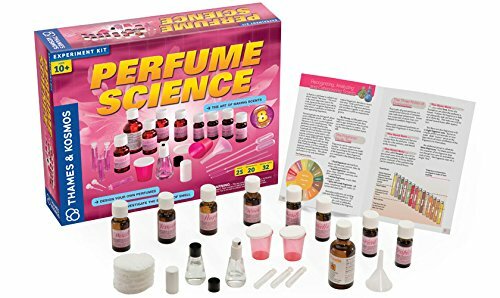 Sophisticated Science - Perfume Science is rated for 10 years, but is a wonderful gift idea for and 8 year old girl to do with adult supervision. Such a great addition to Best Gift Ideas for 8 Year Old Girls. Does your 8 year old girl loves to sing and dance? 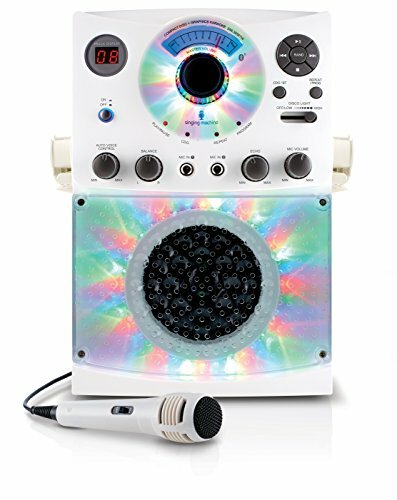 A disco light endowed, CD playing, bluetooth capable and microphone equipped electronic karaoke singing machine would be fun for the whole family. This is a CDG system, which means that it is a compact disc player with graphics. 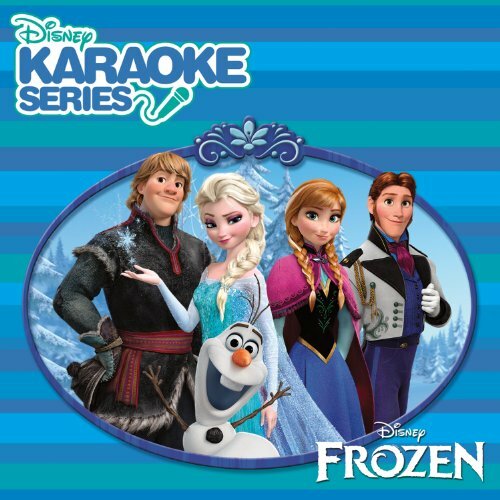 It can be hooked by video output to your television so you can see the words or lyrics to the song as you sing along. How fun is that!! A CD-G CD is made for karaoke and allows the words of the song to be displayed. Regular CDs can be used, but do not have the word display. Buying a stereo cable will allow you to use your other audio devices such as I Phone or MP3 players. Bluetooth capabilities round off the positives of this machine. Pre-teens, Tweens and Teenagers will all enjoy this gift. 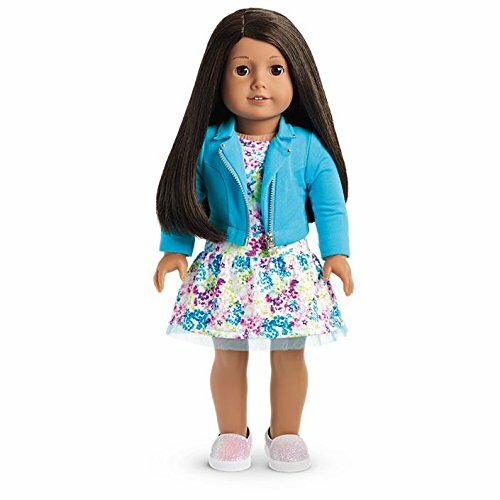 The American Girl Totally Me Dolls come in a variety of hair colors and skin tones. There is one that will match your 8 year olds looks for sure. These are every little girls dream dolls. They come with fashionable clothing and accessories that can be purchased separately. There is even doll and me dresses. The 18" doll I have featured is a medium skin toned girl with medium dark brown textured hair that can be styled. She is wearing a floral printed dress, a blue zip up jacket and sparkly flat shoes. This doll has a cloth body and eyes that blink. With vinyl head and limbs that move, she can be posed in a number of ways. 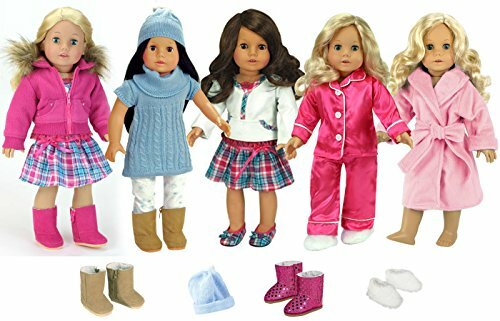 Click here to see a wide selection of Totally Me American Dolls. They are for sure one of the best gift ideas for 8 year old girls. 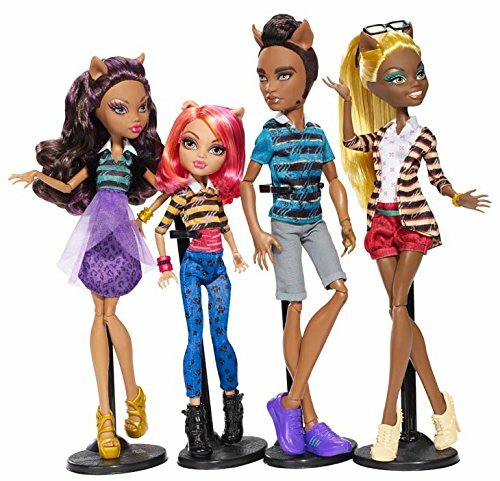 There are several clothing options for these amazing Truly Me dolls. Shown here is a 12 piece clothing selection that will make even the most fashion conscious girl squeal with joy. Mix and match these items to create cool outfits. There are 2 pairs of boots. The first pair is a brown swede "Ugg" style with sheepskin lining, just like your own little treasure may wear. The second pair is a pink sequined pair of dress boots that will coordinate with her outfits in this set. A pink zip up winter jacket or hoodie with a faux fur hood will be sure to keep the dolly warm on those cold winter trips. This coat has two front pockets decorated with studs. An elasticized waist will keep the cold wind out. A blue cable knit short sleeved dress is graced by a shawl neckline. This can be worn with the snowflake leggings and matching blue cap. A pink and teal pleated skirt with pink ribbon accent has a matching white top with plaid trim and pink lace adorning the bottom. It is simply adorable. For bedtime there is a pair of neon pink pajamas highlighted with white piping and a pair of fuzzy white slippers. And lets not forget the cozy pastel pink robe that ties in the front. Such a good gift idea for a girl who has an American Doll. Dollie and Me outfits are just too cute. Your 8 year old fashionista can dress herself and her American Girl doll in identical outfits. She will be so delighted to receive one of these sets as a gift. Both her and her dolly can step out in style! 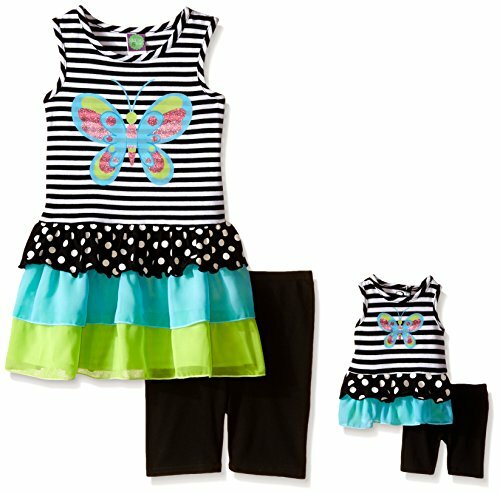 This amazing cotton polyester blend set consists of a tiered dress and bike shorts. The shorts are black and made of acotton/polyester/spandex blend. The top is a black and white striped short sleeved shirt with a scoop neck. The attached ruffled skirt tiers are green, blue and black and white polka dots. A sparkly butterfly motif decorates the front of the shirt. Be prepared for many compliments on both her and her dolls choice of attire. Click here for other beautiful choices in the Dollie and Me line of clothing. Matching outfits are so cool! Your princess will have such fun playing with the many dolls, clothes and accessories for this mock horror genre TV inspired collection. Monster High Doll sets or other merchandise is sure to be one of the best gift ideas for 8 year old girls. Playing dolls with your child can help to deal with real life scenarios that occur in their worlds. Monster High doll sets are my 8 year old grand daughters favorite dolls. Such adventures Clawdeen Wolf and Clawdia Wolf and all the other students at Monster High School have on a rainy day in the toy room. DohVinci is the newest crafting craze for this creative age group created by Play-Doh. This example is a functional clock that your 8 your old can assemble herself. 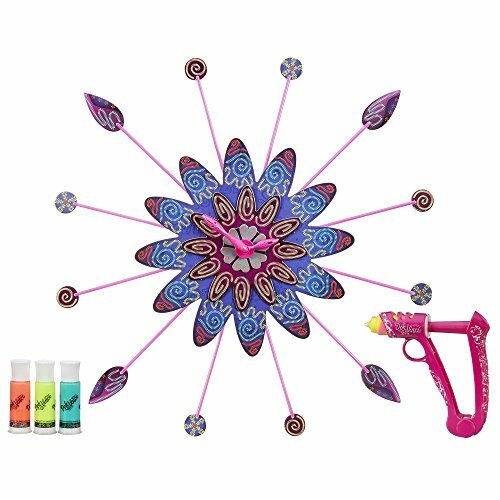 Using the decorative color tubes included in the kit, your little artist will insert the color of her choice into the styling plunger. She can then decorate the clock pieces, using the idea book or her own imagination. There are 27 pieces to decorate, 12 rods to personalize and a clock mechanism with attachment pieces. The detailed instructions are easy to follow for both decorating and assembling her clock. This is a practical and fun craft that she can hang on her wall and use. It will be a pleasure for her to show this completed project to all her friends. Melissa and Doug have been making quality kids items for years. Their craft kits are fun, economical and very appropriate gift ideas. Duct tape crafting is all the rage! 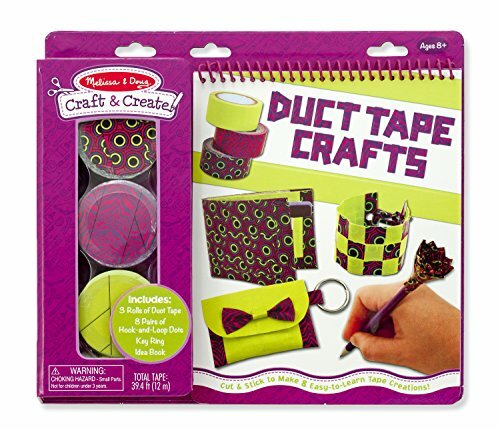 This kit contains 3 rolls of duct tape, 8 hook and loop dots, and an awesome instruction and ideas book. The box itself becomes a book type storage unit for unused materials. With this kit your 8 year old girl can make picture frames, pen toppers, barrettes, key chains and other nifty items. Its a great way to learn how to refurbish dated items. 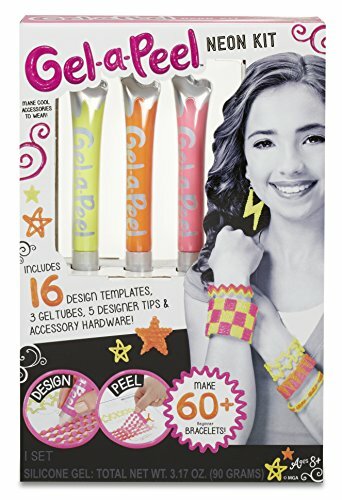 These gel jewelry kits will be so much fun for an 8 year old girl. Imagine her crafting and creating gel jewelry. Your fashionista can trace the provided patterns with the included neon gel pens and then once they dry, just peel and voila, wonderful, colorful, wearable jewelry! Break out the bell bottoms and the peace signs! Here is a Tie Dye Kit that can create wearable art clothes. Girls, boys and kids of all ages love doing projects like this. One suggestion is to protect your working area appropriately. Things could get extremely messy. This is a great idea for a crafty morning with your 8 year olds best friend too. This kit includes everything you need to get started, including a handy instruction booklet. Upcycle old clothing, create pieces of art. 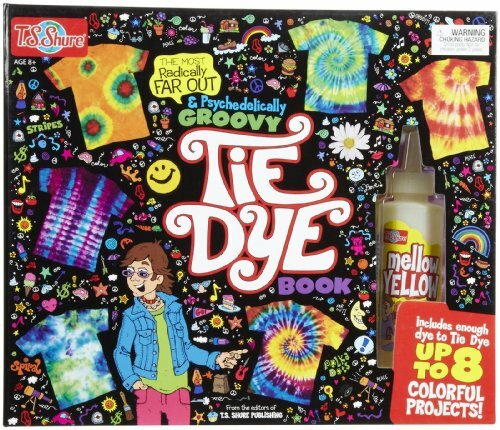 The Ultimate Tie Dye Book and Activity is an affordable and creative gift. When girls or boys cook, it encourages them to eat foods they may not normally eat. Children learn about other cultures and their foods. Learning about measurements develop math skills and emphasizes understanding weight and volume. Reading recipes and lining up ingredients help to foster good organizational behaviors and attention to detail. Cooking and making recipes is wonderful for helping your child follow directions. Health and nutrition are focal points of many kids cook books. Your tween can assist in making a grocery list relating to a recipe and learn good shopping habits such as shopping for deals and making budgets. Kitchen safety becomes second nature. Proper usage of knives and cutting boards, hand washing and oven and stove safety are important skills. Your little princess will love this 141 page book of brightly illustrated, tasty recipes. 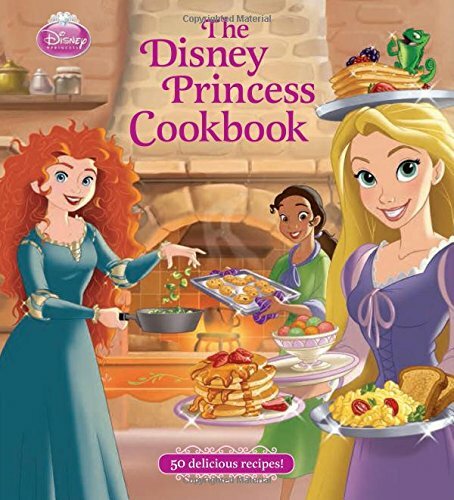 The Disney Princess Cookbook has it all. There are stories about why the princess likes the recipe and a picture of each dish. The pages are glossy and the book itself has a hard cover. This cookbook is very highly rated. 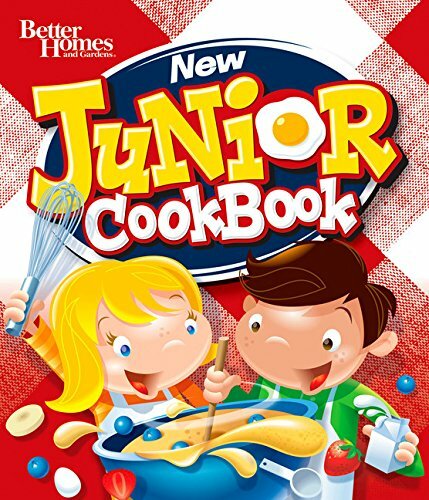 The New Junior Cookbook is a hard cover and spiral bound cookbook that contains 65 easy to follow recipes. Illustrations of each dish are included as well as nutritional information. Does your 8 year old girl love Lego? As a grandmother, I know that Lego is always on the top 10 of a gift wish list. Assembling Lego gifts will build hand-eye coordination and manual dexterity. This DC super hero high school from Lego has 712 pieces of fun for 8 to 12 year olds. Lego products are always durable and provide hours of entertainment. The three level school building has an amethyst on top of it. 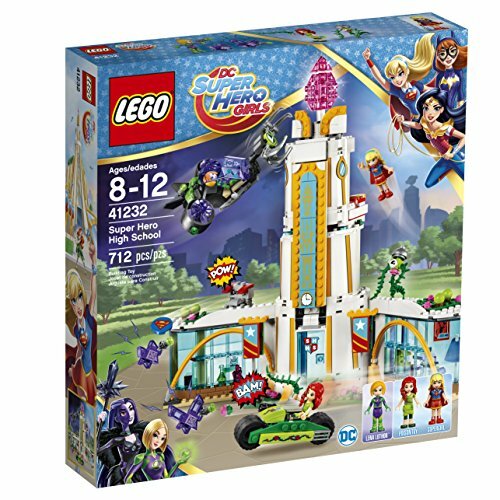 There are 3 small Lego figurines of Super Girl, Lena Luthor and Poison Ivy. Hypnotized purple Kryptomites and Poison Ivys plant decorate the area. Vehicles include a jet and a motorbike. 3 laser pistols and 2 discs round out the weapons arsenal. The adventures your little super hero can create with this Lego set. This Lego kit for girls is made for ages 7-12, so perfect for the 8 year old girl. 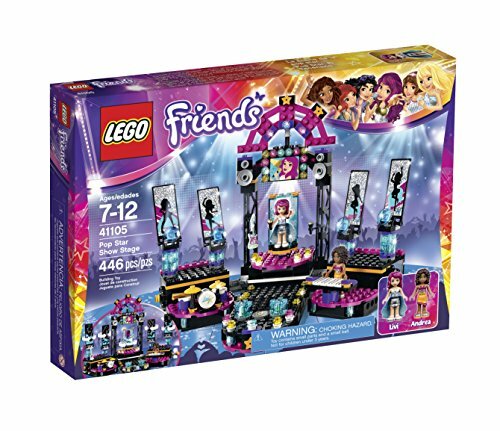 It contains 446 pieces and creates a pop star stage, complete with spinning pieces. The Lego figurines have interchangeable cute fashionable outfits. Dream Catchers are fun for your little girl to make and are a meaningful room decor idea. Bad dreams are a reality for my 8 year old grand-daughter. I purchased a dream-catcher for her and explained the traditions behind these beautiful First Nation symbols. The Fashion Angels Dream Catcher and Journal Kit contains all required materials and instructions to create her masterpiece and also includes a journal! This Dreamcatcher kit is a totally amazing gift idea. I hope you enjoyed reading my article about the Best Gift Ideas for 8 Year old Girls as much as I enjoyed writing it. 8 year old girls have a wonderfully unique perspective. May you enjoy many days of fun and creativity with your sweet little girl. THANKS SO MUCH FOR VISITING BEST TOYS FOR KIDS! FOR MORE GIFT IDEAS, FOLLOW US ON PINTEREST!